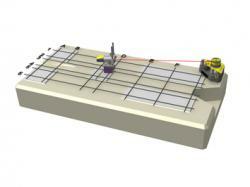 Measure the flatness of any "flat" object with Laser precision. Typical items we can measure for you are flanges, slewing rings, machine beds and machine foundations. If you need to set up machine tools accurately this method works extremely well. The measurements are extremely precise and quick to take. The results can be saved to USB stick and transfered to a PC for later storage or to print out a hard copy. Up to 150 points can be measured in one grid. If you need more on a large are we can combine the grids to allow many more measuring points.